The profitable partnership between the Iris Ceramica Group, SOS - School of Sustainability and Mario Cucinella Architects comes to Milano Design Week 2019 to present the MateriAttiva installation, a multi-sensory experience investigating the new frontiers of ceramics and exhorting us to adopt new forms of sustainable development. Located in the heart of the Brera Design District, MateriAttiva views sustainability as a tool for sealing a new pact between humans and nature. Diesel Living and Iris Ceramica renew their partnership to present their new LIQUID COSMO collection at Salone del Mobile 2019. Ethics and sustainability have always been present in the history of our group and the green mentality was not born only recently, but we have always tried to bring together ecology and economy with an attentive look at the well-being of all our stakeholders as well. Social commitment and solidarity in the name of the motorcycling champion who has become a symbol of strength and courage: “Casa Marco Simoncelli" is a home for the disabled in the province of Rimini, built using materials from the Iris Ceramica collections. 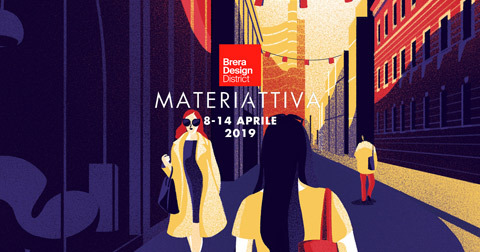 IRIS CERAMICA will be participating in Fuorisalone 2019 in the heart of the Brera Design District (on Via Balzan at the corner of Via San Marco) with the installation MateriAttiva, open to the public April 8 through 14 2019. On Wednesday, 6 February the Iris Ceramica showroom hosted a meeting between Iris Ceramica Group CEO Federica Minozzi and Modena Volley general director Andrea Sartoretti, coach Julio Velasco, captain Ivan Zaytsev and players Micah Christenson and Maxwell Holt, with Gianpaolo Maini as moderator. Iris Ceramica flies to Cologne to show the exclusive Diesel Living with Iris Ceramica collections.